NASA gives thumbs up to use of colloidal silver as antibiotic in space; FDA has no jurisdiction in high orbit. (NaturalNews) In the day-to-day happenings of world politics, the United States and Russia are presented on the global stage as arch-enemies. Up in space, however, it's a completely different story. Enter the International Space Station (ISS), which for years has housed astronauts from both countries along with life-support systems unique to each country's needs. The two sides have long remained separate from one another until recently. For years, the U.S. side of the ISS utilized iodine as its water cleansing agent of choice, while the Russian side took advantage of antibacterial silver for water purification purposes. Both sides coexisted peacefully in their respective methods, with the U.S. picking up whatever extra water the Russian side had leftover. Russia's water purification process has always been much more efficient than that of the U.S. It seemed that the two opposing nations would never find a common bond in adopting a single, standardized water purification method that served the interests of everyone. However, the National Aeronautics and Space Administration (NASA) recently made the decision to adopt Russia's method of purifying its water after coming to the realization that adding ionized silver to water is easier, more effective, and much more efficient than adding iodine. "Unlike iodine, silver doesn't have to be filtered out of the water," explains a report by Bloomberg, noting that iodine has to be filtered out of the U.S. water after use. "Epsom salts (magnesium) are added to improve its taste." Isn't the U.S. Food and Drug Administration (FDA) adamantly opposed to people using silver as a safe bactericide? The agency has repeatedly targeted companies trying to help people with antibacterial silver, including during the recent Ebola epidemic when it threatened organizations like the Natural Solutions Foundation for attempting to help Ebola victims by providing them with silver water. What about the FDA's persecution of Texas-based Utopia Silver Supplements, which has been fighting the agency for more than five years to defend its sale and distribution of colloidal silver supplements? The FDA continues to stonewall all attempts to conduct honest research into silver's bacteria-destroying properties, and they have even threatened to shut down companies that sell it for personal and/or medical use. The FDA apparently has no jurisdiction up in space, as both U.S. and Russian astronauts will now be taking advantage of silver as a water purifier. Clean water is understandably hard to come by on a space shuttle, and any method of obtaining it is open game. The fact that silver is now the primary method of keeping astronauts alive says a lot about its therapeutic potential. The U.S. side of the ISS will continue to produce drinking water using iodine as a backup. As ISS subsystems manager Layne Carter puts it, they plan "to have dissimilar redundancies in the space station in case one of the systems has problems." Nevertheless, the purifying method of choice will now be silver. 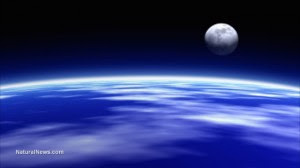 "Due to widespread growth in the use of colloidal silver as a biocidal agent, development of a simple and cost efficient method of silver testing is valuable," admits NASA on its website. "On station, silver is used as a biocidal agent based on its antimicrobial properties in the potable water system." NASA is supporting research into a simple technique that it says will allow ISS crew members to test silver levels in water in less than two minutes. effects whatsoever from the highest concentrations." fungicidal for Candida albicans, Candida globata and M. furfur. for fighting infection and related infectious diseases. intakes of silver may be more prone to infection. internally, it works against syphilis, cholera, malaria diabetes and severe burns. alertness, as well as enjoying better overall health throughout the year. longer reproduce successfully in your body. man-made antibiotics which are basically "bug poison for the human body,"
it suffocates them by disabling the enzyme they need for respiration. way into the large intestine so it can very quickly take care of the problem. What Specifically Can Colloidal Silver Be Used For? numerous forms of viruses, warts and stomach ulcers. began looking back to the past for answers. In doing so, they have r! Department of Surgery, received a grant to develop better treatments for burn victims. cannot be seen by the naked eye and are electrically charged. clear to silverish in the liquid suspension. Will Colloidal Silver Kill the "Friendly Bacteria" in Your Intestines? upset your natural intestinal floral balance. based minerals in North America have dropped over 85% in the last 100 years. How Long Has Silver Been Used As A Medicine? Silver Has Been Used in Medicine Since 69 B.C. "The antimicrobial effects of silver (Ag) have been recognized for thousands of years. In ancient times, it was used in water containers (Grier 1983) and to prevent putrefaction of liquids and foods. In ancient times in Mexico, water and milk were kept in silver containers (Davis and Etris 1997). 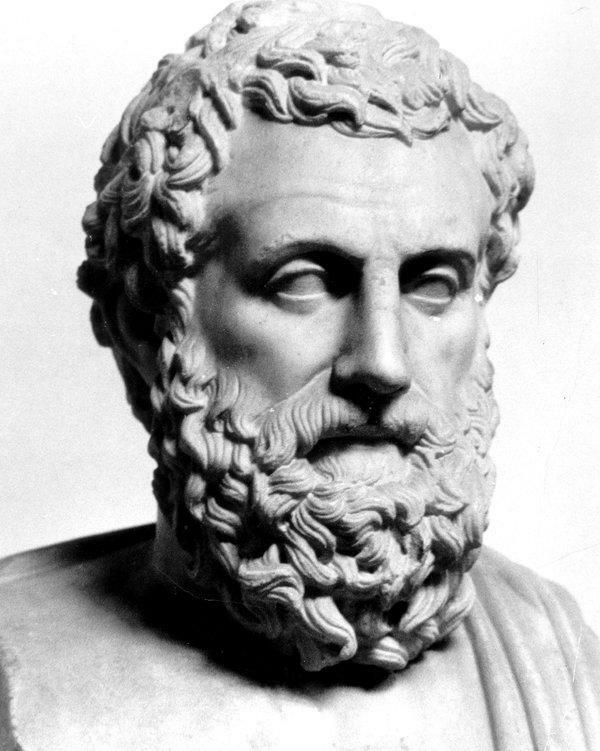 Silver was also mentioned in the Roman pharmacopoeia of 69 b.c. (Davis and Etris 1997)." 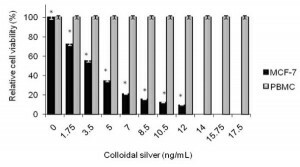 The overall results indicated that the colloidal silver has antitumor activity through induction of apoptosis in MCF-7 breast cancer cell line, suggesting that colloidal silver might be a potential alternative agent for human breast cancer therapy. There you have it folks.. Colloidal Silver = positive results for breast cancer. Google searches reveal HUNDREDS more testimonials bycolloidal silver users with regards to other types of cancers and illnesses. "Silver can kill some cancers as effectively as chemotherapy and with potentially fewer side effects, new research claims. The metal already has a wide range of medicinal uses and is a common antiseptic, antibiotic and means of purifying water in the third world. And British researchers now say that silver compounds are as effective at killing certain cancer cells as a leading chemotherapy drug, but with potentially far fewer side-effects. Researchers from the University of Leeds conducted lab tests which exposed breast and colon cancer cells to various silver-based chemicals over a six day period. Results, published in journal Dalton Transactions, showed that these silver-compounds were ‘as effective as Cisplatin’ at killing cancer with potentially fewer side effects. While the team are still unsure about how exactly silver battles cancer, they think its effectiveness may be caused by the structure surrounding silver atoms, known as its ligand. They think this may help release the silver ion into cells when it enters the body, killing any cancer. Study author Dr Charlotte Willans plans to spend the next year looking closely at what effect silver has on both cancerous and healthy cells, and whether it could be a safe and effective new anti-cancer drug. She said: 'It’s certainly an exciting discovery, although I think we have a lot of work to do in the future. It opens the doors in terms of what we can do and investigate. 'Getting these results also gives us the opportunity we need to apply for funding to take the research further. Explaining the research in greater detail, Dr Willans added: 'As many are unfortunately aware, chemotherapy can be a very gruelling experience for the patient. 'Finding effective, yet non-toxic drugs is an ongoing problem, but these preliminary results are an important step in solving it. 'Our research has looked at the structure which surrounds a central silver atom. This "shrubbery" is what determines how reactive it is and what it will interact with. 'Our research has used different types of these ligands to see which is the most effective against cancer cells." There has been a resurgence of medical interest in silver, according to Prof Edwards Jones, because it effectively kills antibiotic resistant bacteria such as MRSA. More and more silver-based products that help heal wounds and combat infection are appearing on the shop shelves. So what can silver do for you? Silver ions kill underarm bacteria responsible for causing bad odour and are non-irritating. Try Nivea for Men's Silver Protect (£2.35, www.boots.com). Doctors at Great Ormond Street Hospital developed socks containing silver to combat infection and blistering in a foot disease called epidermolysis bullosa. Now the socks are being marketed as they reduce foot odour ( £7.99, www.silversock.co.uk). Crocs are launching an anti-odour sports shoe containing silver in their soles this spring. Plasters containing silver can reduce the risk of infection and speed healing. Try Boots Advanced First Aid Faster Healing Hydrocolloid Plasters (£3.99 for 16, www.boots.com). Carex has just launched an antibacterial handwash containing silver. Carex Bacteria Protect (£1.38), from pharmacies and supermarkets nationwide. 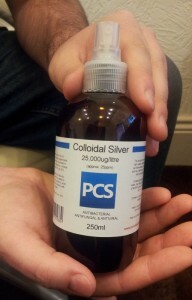 Pro Colloidal Silver's atomiser (£13.95 for 250ml) is a solution of colloidal silver which acts as a non-irritating disinfectant when sprayed on to skin or wounds (www.procolloidalsilver.com). In 2007, the NHS spent more than £23million on silver dressings for leg ulcers and the Health Protection Agency has recommended that silver-coated catheters be introduced for the prevention of urinary tract infections. Indeed, silver is set to be increasingly added to medical equipment and hospital furniture as a way of preventing hospital-based infections. 'Research with the Heart of England NHS Foundation Trust has found that silver, incorporated in the surfaces of hospital equipment furniture, can reduce bacterial levels by 99 per cent,' says Dr Richard Hastings, microbiologist for BioCote, a Wolverhampton company that makes silver-based medical products. 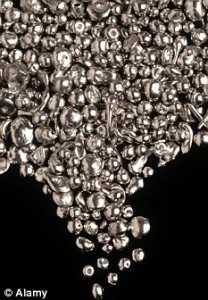 Silver is also emerging as an effective tool for the treatment of skin conditions, burns and wounds. 'Silver dressings are now widely used to aid wound healing. In the treatment of burns, where there is a high risk of irritation and infection, it has been very successful,' says Prof Edwards Jones. And silver may also one day be used as an internal antibiotic-In a study at the University of Texas, silver particles killed 100 per cent of the HIV virus within three hours. It also killed the flu virus as well as the antibiotic resistant superbug, MRSA. However, more research needs to be conducted for the internal use of silver to be considered safe. 'A side effect when taken internally, is that you can develop blue discolouration beneath the skin,' says Prof Edwards Jones. Jamaicans Are Learning About Colloidal Silver.. With GREAT Results! BROWNS TOWN, St Ann:COLLOIDAL SILVER was used by doctors in the early 20th century, but after the development of more modern antibiotics, its use dwindled. Since the 1990s, however, there has been a resurgence of its use amid claims that it is a cure-all. Colloidal silver is now in Jamaica and several residents who have used the product are reporting amazing health benefits, dubbing it the miracle water. Among them is 56-year-old Norman Campbell, popularly know as Boy Blue, of Standfast district in Browns Town, St Ann. Campbell told The Gleaner that he had an enlarged prostate, but after taking the water in prescribed doses for three months, the problem went away. Tzdhne Ishigyhd, a Rastafarian who lives in the Corporate Area, said she is a lupus survivor and since using colloidal silver, the disease has gone into remission. Another woman, Erna Hunter of Steer Town, St Ann, said the miracle water has lowered her blood sugar level, got rid of pain in her legs, and got rid of her sinus-related problems. Devon Hall markets the product from Browns Town, St Ann. He told The Gleaner he was introduced to it while he was living in London. In 1995, while I was living in London my wife suffered with allergies and both of us had chronic sinus problems a gentleman from Iran introduced it to me. So we ordered two bottles and we took it, and since then, from 1995 to date, the problem has not reoccurred, Hall said. In 2010, he started bottling the product locally, and the responses have been startling. Persons have used the product and have returned to Hall with the news that their problems conditions such as enlarged prostate, arthritis, Type II diabetes, lupus, chronic sinusitis, ear infections, yeast infections, among several others are no more. When The Gleaner caught up with Campbell, he spoke about his experience. Mi did have a prostate problem: Mi prostate did swell. Mi did sick and inna di hospital. I was to operate on it in January this year, Campbell related. He said after being discharged from the hospital, he had to keep wearing a catheter because he couldnt pass his urine naturally. He wore it for a year. But late last year, something happened that changed his life forever: He met Hall, who introduced him to colloidal silver. He decided to try it. This was around October. 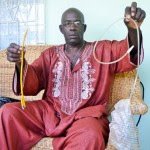 On January 17, five days before the scheduled operation at the St Anns Bay Hospital, and three months after he started taking the product, the catheter fell out. Mi get scared and rush to hospital, Campbell said. The doctor checked me and say the prostate shrink back! Is just God and the water wha mi drink! Prior to that, he said the pain associated with the enlarged prostate had disappeared. And it control mi sugar because Im diabetic. I recommend this to the whole world! According to Ishigyhd: I started taking the colloidal silver earlier this year. I knew about it before but didnt know where to get it. I was still having symptoms of the lupus rash and a stubborn joint pain but I feel good now! They (doctors) tried to prescribe steroids, but I didnt like that, so the colloidal silver came along and speeded up the process. Hunter said because of the pain in her feet, she could hardly walk at times. She is diabetic and also suffers from sinusitis. At nights, I used to cough a lot because of the sinus, Hunter said. She was introduced to the product by her daughter, who had heard about it. Hunter bought a bottle in January and within two to three weeks, she saw results. The sinus gone, the pain gone, mi sugar (level) way down. I can walk go anywhere now because my feet dont hurt anymore. Its really good! 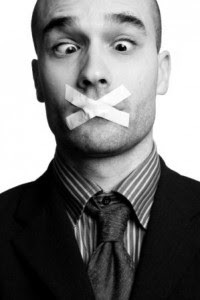 With all the positive feedback that Hall has been getting from the product, he was quick to point out that he was not a doctor nor pretending to be one. Many people, since they have tried it, they have come back and say yes, it has made a difference in their lives. Its like a gift sent from God, Hall stated. 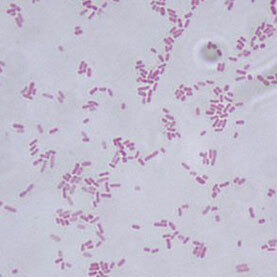 Like werewolves and vampires, bacteria have a weakness: silver. The precious metal has been used to fight infection for thousands of years — Hippocrates first described its antimicrobial properties in 400 bc — but how it works has been a mystery. Now, a team led by James Collins, a biomedical engineer at Boston University in Massachusetts, has described how silver can disrupt bacteria, and shown that the ancient treatment could help to deal with the thoroughly modern scourge of antibiotic resistance. The work is published today in Science Translational Medicine, and as you well know silver is the key component in Colloidal Silver. Collins and his team found that silver — in the form of dissolved ions — attacks bacterial cells in two main ways: it makes the cell membrane more permeable, and it interferes with the cell’s metabolism, leading to the overproduction of reactive, and often toxic, oxygen compounds. Both mechanisms could potentially be harnessed to make today’s antibiotics more effective against resistant bacteria, Collins says. Many antibiotics are thought to kill their targets by producing reactive oxygen compounds, and Collins and his team showed that when boosted with a small amount of silver these drugs could kill between 10 and 1,000 times as many bacteria. The increased membrane permeability also allows more antibiotics to enter the bacterial cells, which may overwhelm the resistance mechanisms that rely on shuttling the drug back out. VIDEO: Single cell organism gets wiped by low strength colloidal silver! Works in very much the same way with eliminating pathogens and bacteria from the body! Not even Anthrax or MRSA can survive Colloidal Silver! 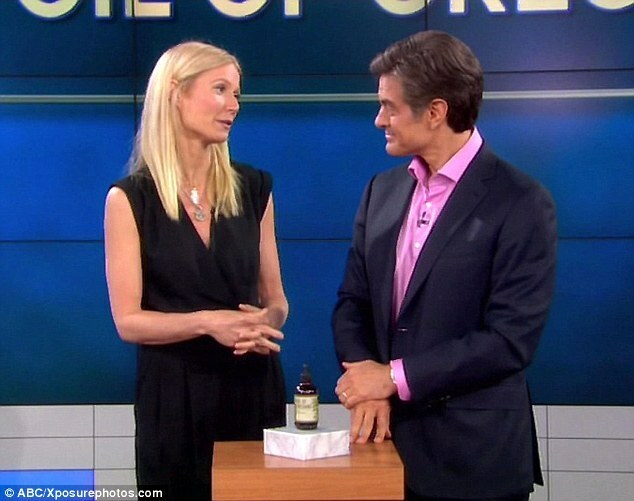 What do TV’s Dr. Oz and Hollywood glamour gal Gwyneth Paltrow have in common? You might be surprised to learn it’s a mutual love for colloidal silver! And now they’ve both publicly endorsed it, on The Dr. Oz Show. TV’s Dr. Oz has publicly endorsed colloidal silver usage…again, for the third time in the past 18 months. This time, he’s done so along with Academy Award-winning actress Gwyneth Paltrow, author of the best-selling new natural health cookbook, It’s All Good. As you may remember, Dr. Oz first publicly endorsed colloidal silver usage on his television program, The Dr. Oz Show back on February 9, 2012. During the show, he dubbed colloidal silver a great remedy for sore throats, and said other sore throat remedies don’t work as well because they don’t address the root cause of the problem, which of course, is the infection. Then, in another episode of his show in February 2013, he introduced his viewers to his father-in-law, the world-renowned cardiothoracic surgeon Dr. Gerald Lemole, M.D., and explained that his father-in-law often incurred the wrath of his fellow medical doctors by recommending natural treatments when he felt they were called for. Dr. Oz agreed with him, and even allowed his father-in-law to reach over with a pump-spray bottle of colloidal silver and playfully spray some into his throat, hitting Dr. Oz on the chin with some of the silver spray by mistake. So twice in a one-year period Dr. Oz publicly endorsed the use of colloidal silver on his television show. Now, on the August 29, 2013 episode of The Dr. Oz Show, both Dr. Oz and well-known actress Gwyneth Paltrow – star of numerous Hollywood films and winner of an Oscar for her performance as Lady Viola in Shakespeare in Love — heartily endorsed colloidal silver usage.Indeed, after talking about her new book on natural health cooking for a few minutes, Dr. Oz then took Gwyneth Paltrow over to an onstage display of Paltro’s four favorite natural health remedies, and asked her to explain how she uses each one. Dr. Oz: (gesturing toward a tiny bottle of colloidal silver) The next trick is to help avoid germs. Dr. Oz: There’s actually a TON of data behind it. Please share it with everyone. Dr. Oz: This actually was the first antibiotic. It was silver. Dr. Oz: Yes. They used to put silver coins in milk to keep the milk clean. These are accepted therapies. And you know, we haven’t thought about it very much, because we have antibiotics. But this is a very smart way of killing of stuff. We actually, in our family, are crazy about squirting it in our throat. It’s our throat spray, our everyday throat spray. We squirt it in there, and off we go. Do you do that too? Dr. Oz: What do you think of the taste? Gwyneth Paltrow: I don’t think it’s so bad. It’s pretty mellow. Dr. Oz: It’s pretty neutral. But we have some fun home remedies for making it taste more palatable for the kids. If you make it taste good for the kids, they actually will believe it’s something important for them. Okay? Dr. Oz: By the way, all of these remedies are available in health food stores. And that was the end of the segment on colloidal silver. Yes, it was very short. Maybe one day Dr. Oz will do a full show on the benefits of colloidal silver. We can only hope. But until then, we have to be thankful that a man with such a huge national following has been willing to thrust colloidal silver firmly into the limelight three times in the past 18 months, however briefly! As you can see, Dr. Oz seemed particularly enamored of using colloidal silver as a daily throat spray for the entire family, to help keep germs away. And Gwyneth Paltrow seemed to be more interested in using it externally, as a viral disinfectant, as well as under the tongue, as an antiviral remedy. Of course, colloidal silver is well-known for its profound antibacterial and antiviral qualities. Those are indeed two of the most obvious and beneficial uses of colloidal silver. But you can learn dozens more ways people use colloidal silver to fight infection and disease – even serious diseases like MRSA and food poisoning — on the Colloidal Silver Success Stories website. Obviously, this kind of publicity for colloidal silver from such nationally recognized celebrities and well-known natural health proponents can only be good. And that’s particularly true since the FDA has been so adamant about keeping knowledge of colloidal silver usage suppressed by passing regulations making it illegal for colloidal silver manufacturers to tell the American public about its astonishing array of infection-fighting benefits. So kudos to Dr. Oz and to Gwyneth Paltrow for taking a public stand on behalf of safe, natural colloidal silver, and helping bring it to the attention of the American public who are still largely unaware of its powerful and medically documented healing and infection-fighting qualities. To learn more about colloidal silver and its long history as a safe, natural infection-fighting agent (and to see what other top medical experts have to say about it, as well) see this article.